KAC believes that the quickest way for our youth to embrace being part of this globalized world and become future leaders is to bring the opportunity to engage with the world to their everyday classroom. We are able to provide students in the U.S. and Japan a rewarding online language and cultural exchange program for free thanks to the generosity of individuals and organizations like you! Many of the schools participating in Global Classmates are public schools with limited budgets and have students with little or no access to international experiences. Your support will help KAC continue to bring our program to these students and inspire them to take the first step in becoming global citizens. KAC is a non-profit 501(c)(3) organization. All donations are tax deductible to the extent allowed by law. Our survey has shown that after participating in Global Classmates, 93% of students believe they now know more about each other’s culture and 82% of students strengthened their desire to learn more about the other culture through study abroad. In addition, 80% of students became more comfortable writing in Japanese/English.We are making a real impact in these students’ lives! Please click here to read participant testimonials. KAC is always looking for teachers who are passionate about offering their students an innovative educational experience. If you know of any teachers who may be interested in our online language and cultural exchange program, please share the following informational flyer with them. In addition, if you know of a teacher group that would be interested in finding out more about the program, please contact us at info@KACultures.org in the U.S., and japan@KACultures.org in Japan to let us know. We’d be happy to reach out to the group and offer more information. For information about the application process, please click here. Follow what KAC is up to and share it with your friends by liking our Facebook page! 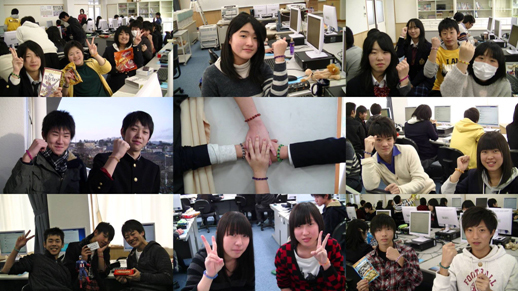 We post some fun updates about our Global Classmates students as well as interesting cultural information!